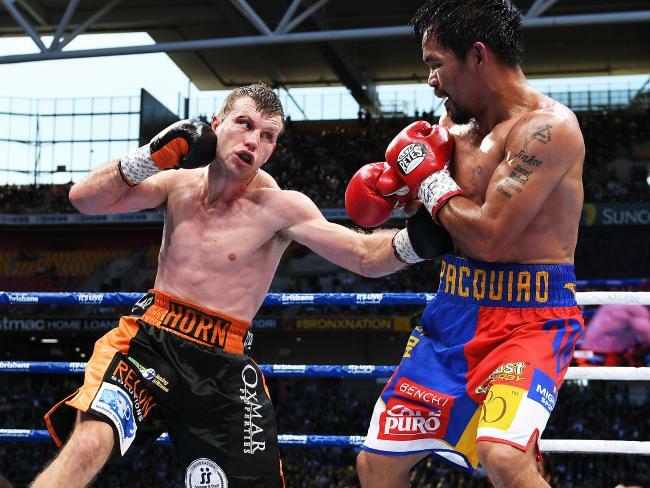 In a win described by commentator Danny Green “unbelievable”, Jeff Horn has defeated Manny Pacquiao via unaimous decision (115-113 x 2, 117-111) in what was a stunning upset at Suncorp Stadium in Brisbane today. The fight is being broadcast live on cable TV in the US but that doesn’t mean Jeff Horn’s about to become a household name in the States anytime soon. In an article on American sports website Deadspin - where they analysed the motivation behind Pacquiao choosing to fight the unheralded Australian - the piece illustrated how far Horn has to go to earn respect on the world boxing circuit. “Horn is undefeated in 17 fights (16-0-1), but he’s fought mediocre competition and you won’t find many serious boxing fans or writers who give him a chance,” Daniel Roberts wrote. This assessment comes on the back of esteemed ESPN boxing writer Dan Rafael also refusing to hype Horn up, labelling him “Jeff Who”. “Horn’s resume is weak,” Rafael wrote. “His two most notable wins are the KO of Ali Funeka, who was at his best as a lightweight but lost title fights to Nate Campbell and Joan Guzman nearly a decade ago, and a seventh-round knockout earlier in 2016 against long-faded former junior welterweight and welterweight titleist Randall Bailey. “(He) has not done anything to warrant his status as Pacquiao’s mandatory challenger.